Register your party with local police. Each state in Australia (not ACT) has its own Party Register along with tips how to enjoy a safe and fun party. The simple question is: Why wouldn't you register? How good is this Victoria? Register your party with Victoria Police and they will an keep an eye on your party.. for free! The Victoria Police Partysafe program is about minimising the risks such as violence, intoxicated guests, or gatecrashers so that party hosts and their guests can stay safe and have fun. Victoria Police Partysafe allows you to register your party with the police online or at your local police station. The registration form is important to ensure police are aware of the event and can provide timely assistance if things start to get out of hand. Read the Victoria Police Partysafe brochure. Complete the Victoria Police Partysafe registration form. This can be completed online, or you can download a copy of the registration form and submit to your local police station. Alternatively you can attend your local police station to register. Make sure you enter all the details correctly before submitting your form either online or at your local police station nearest the party. After you register, ensure that you download or collect a poster from your local police station to place at the front door showing guests the party has been registered with Victoria Police. When you register, consider the following. The number of people likely to attend your party. Always remember, if you are unable to handle the situation, call police on Triple Zero (000). ACT Policing is encouraging residents to “party safely and party smart” as the warmer weather, daylight saving and impending school holidays begins to bring people out to town centres and the city centre. Recent instances of both anti-social and criminal behaviour have prompted police to issue this warning well in advance of the traditional summer celebrations. “We have made significant arrests in the past week of alleged drug distributors and dealers in Canberra,” Commander Steve Lancaster, Deputy Chief Police Officer, said today. “We made a further drug apprehension over the weekend at the Stonefest festival. Our drug intelligence and plain clothes detectives will continue their good work targeting known drug dealers and users. “Our general duties police were very busy over the weekend as a result of a number of private parties being gate-crashed and/or allowed to get out of control. There are some very clear guidelines if you are hosting a party at home, and one of them is to ensure you have a guest list, not a GUESS list. ACT Policing can provide you with a Party Smart kit to help you plan your event. “Lastly, we want to warn the community that excessive drinking can lead to young people finding themselves in vulnerable situations. “Sexual assault, theft and other criminal behaviour can more readily occur when people are under the influence of alcohol, or drugs – where their judgement or responses are impaired. “Don’t let yourself become a victim. Party safely, and party smart,” Cmndr Lancaster added. Everyone enjoys going to or hosting a party. 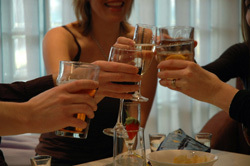 For young people it is certainly a part of growing up and celebrating special occasions with their friends. There are many things to consider when planning a party, and good planning can reduce the risk of potential problems on the night. This site provides some great ideas to help you make your party safe, lawful and enjoyable for everyone concerned including, parents, hosts and guests. Party Safe allows you to register your party with your local police. More information on how to register your Party Safe party and what this will mean for your party is available on our Party Safe Registration page. Try and register your party at least two weeks beforehand so that police are able to supply you with all your Party Safe wristbands and other helpful information well in time for your party. Share your thoughts: Have you registered a party with Police? We would greatly appreciate your completing the Party Safe Survey and giving us your feedback on the QPS Party Safe Program. These information sheets have some great ideas to assist in holding successful, safe and lawful parties for everyone concerned including parents, hosts and guests. New laws have come into effect which will impact anyone who organises, or is involved in, and event that becomes or could become out-of-control. For general information about alcohol-related health issues and Australian Government policy go to http://www.alcohol.gov.au. The Queensland Health’s Alcohol, Tobacco and Other Drugs website provides information and resources on the effects and impact of alcohol and other drug use. The Australian Drug Foundation’s DrugInfo website offers information about alcohol and other drugs and the prevention of related harm. If you are unable to handle a situation, call the local police or, in an emergency or life threatening situation, call Triple Zero (000). For confidential 24-hour alcohol and drug information and counselling, free call the Alcohol and Drug Information Service on 1800 177 833. Party Safe can assist you to make your party a safe and enjoyable event for your friends and family. The booklet includes a copy of the Party Safe notification form. Download the Party Safe booklet or get a copy from your local police station. Complete a Party Safe notification form and return it to the police station in the area where the event is being held. A copy of the notification form is included in the Party Safe booklet. Download the Party Safe notification form or get a copy from your local police station. New laws came into effect from Saturday 15 December for anyone who organises a gathering that becomes out of control. The Criminal Law Amendment (Out-of-Control Gatherings) Act 2012 provides police with additional powers to manage an out-of-control gathering. The legislation also gives the courts the discretion to order a person to pay reasonable compensation costs to police for their response to the out-of-control gathering. As a host, you have a duty-of-care for the safety and wellbeing of your guests. While you want them to have a good time you also want to minimise the potential for harm to persons and property as a result of excessive alcohol consumption or gatecrashers. You could be held partly or fully responsible for something that happens to one of your guests at your party. The guide Hosting a Party for Teenagers provides information and advice for parents when considering hosting a party with teenagers or allowing them to attend a party elsewhere. This guide is available at the Alcohol.Think Again website, which provides numerous resources for parents about alcohol and young people. Note: the term 'gathering' is now commonly used by teenagers as a substitute for the word 'party'. Please register your party with WA Police in advance of your party or event. You can register online up to 28 days beforehand. Only parties / events to be held in Western Australia can be registered with WA Police. As responsible hosts you are also encouraged to register your party so that, if trouble does arise, the police have important information on which to rely when attending to your call. It is in the public interest in order to maintain community order and safety. The information you provide on the party registration form will be kept in strict confidence and used only by police in the event police need to respond to an incident at your party. Please note: registering your party with WA Police does not mean that police will provide security for your party and that the capacity of police to undertake patrols of party venues or to visit a party venue in the event of trouble will depend on other demands on resources at the time and the nature of the event in question. You can register as late as the day of the party / event; however the registration form will accept a date up to a maximum of 28 days in advance. Once you have submitted the online form your party / event will be registered with the Western Australia Police. Please note: Should you encounter any problems at your party / event that require Police attendance please call 131444. Contacting police: For police assistance in the event of trouble call 131444 or in an emergency call 000. Click here to read some frequently asked questions about out-of-control gatherings. The Party Safe Program provides education and support to members of the community intending to hold a party. The Program aims to promote responsible organisation and conduct of parties in order to minimise the potential for harm to persons and property. One aspect of the Program involves the registration of parties with Tasmania Police. Registration of a party provides Tasmania Police with the necessary details in the event we are called to deal with an incident at your party. The capacity of police to undertake patrols of party venues or to visit a party venue in the event of trouble will depend on other demands and priorities on Tasmania Police resources at the time and the nature of the incident. Registering your party does not mean that it is an invitation for the police to come into your home. Police will not attend a registered party unless there is a specific request to do so. This request is not restricted to someone from the party but may include a third party, such as a neighbour or concerned parent; or if it is in the public interest in order to maintain community order and safety. Party registrations should be provided to police seven days prior to the event. The Sale and Supply of Alcohol to Youths (Police Offences Act 1935) legislation regulates the supply of alcohol to people under 18 years, on private property. So, you’re going to have a party – or going to a party – and you’re going to have a great time – right? Hopefully. But not always. Drunks, gate crashers, arguments, neighbours’ complaints and, occasionally, fights can ruin the occasion. Alcohol consumption can be an unpredictable social factor. But there are ways to avoid such pitfalls. These tips – for party hosts, guests and parents – will help ensure parties are what they are meant to be – an event where everyone has a good time. Inform neighbours in advance and provide a phone number in case they wish to contact you. Issue written invitations and make entry by invitation only. Put a finishing time as well as start time on the invitation. If it’s a young person’s party make sure there are non-drinking adults attending. Encourage parents to collect their children at a pre-arranged time. BYO parties can lead to excessive supply and unsupervised drinking. Make alcohol available from one area, served by a non-drinking adult. Restrict the supply of full strength beers, champagne, wines and spirits. Eating can slow down the rate at which alcohol is absorbed, but avoid salty foods which will encourage more drinking. If all else fails – you’re the host, you can ask people to leave. Be verbally assertive to gain control of the situation. Call police if matters are getting out of control, before they get worse. Don’t tell others who haven’t been invited about the party, the most common cause of gatecrashing. Don’t drive to a party if you’re going to have a drink, pool with other guests and nominate a sober driver to drive everyone home or arrange to be picked up at the end of the party. Link up with others to look out for each other, both at the party and getting home. Don’t take alcohol unless specifically asked and don’t take more than you will drink. Excessive supplies can lead to excessive consumption. Speak with the host’s parents about the invitation list, numbers attending, age range, food and alcohol provision and pick-up times. Make sure you know the address and telephone number of the venue. Be clear about when to drop your child off and when to pick them up, thus avoiding children collecting on the street unsupervised. * It’s possible to register your party with police. Pick up a Safe Party Registration Form from your local station (parties must be registered at least seven days before the date). Alternatively you can download the form by clicking on the link on the top right hand side of this page. Police will unobtrusively monitor the event and your registration provides police with the information needed should trouble occur.